As you can see we will have lot of different solutions at the end of this tutorial. 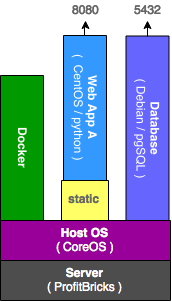 This structure is not production wise, it's just to show what Docker can do. I've picked pgSQL for this tutorial, bust you must look at this more as concept, because you can do it with any DB (SQL and noneSQL). With Docker your life should be easy, you don't have to install machines and DB's anymore, you just download image you need and use it. Most of the software have images ready in Docker Hub and lot of them already have preconfigured images made by users. But what is Docker Hub? It's official public images repository - https://hub.docker.com. You can register and upload your images to the hub for personal and public use. If you will continue use Docker you will meet personal registries (own by companies or private people), they work same way (later in our tutorials we will even install registry server). It's always suggested to take official repositories and make modifications for them, but if you're lazy and there is user repository that fit your needs (check what images include). If you're using user repository it's also important to check last update. Sometimes it's good to use old but stable versions, but sometime you need updated one. Inside the repository you will see tags information (usually tags represent versions) and how to use the repository. postgres:latest: The image you are pulling has been verified. Important: image verification is a tech preview feature and should not be relied on to provide security. So now we have DB with default database, let's connect to it! But how? 'postgres_test' is name of the container but not DNS name. How does Docker network works? Next part is to create an application that will connect to our DB and use it. 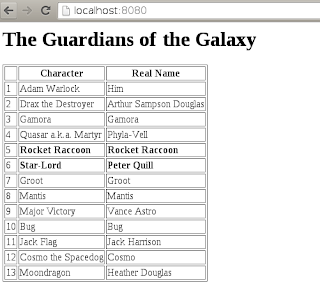 query = "INSERT INTO Guardians (Character, RealName, TeamLeader) VALUES (%s, %s, %s)"
And now for the interesting part, get this to container! You can always start simple CentOS container and copy files there and start them, but why use Docker for this? In Docker we make it simpler and more automatic - we make and image, just like image you just downloaded! LABEL Description="guardians:1 - WebApp to print Guardians list" Vendor="Forthscale" Version="1.0"
Save the scripts to the new directory and before we proceed, what we are doing here? FROM - Image name + tag. This is the image on which our image is based, so it will contain everything from it. 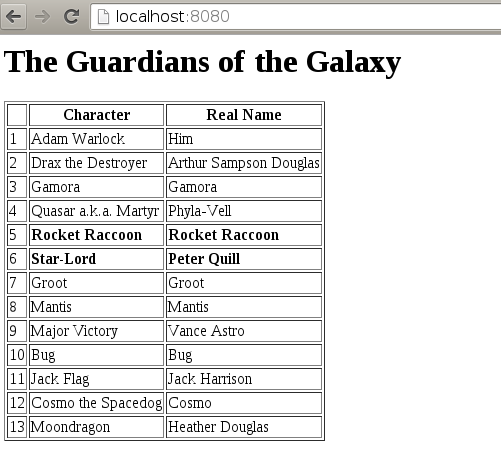 ~/docker_image_1 $ docker build -t forthscale/guardians:1.0 . Step 2 : LABEL Description "guardians:1 - WebApp to print Guardians list" Vendor "Forthscale" Version "1.0"
--link - Linking to container. First write container name (that's why it's important to name your containers) and second write what name to use for it inside the container (I prefer to use same name). But wait, that's not all, you can make even more! We can have shared directory for all the containers and for example server static files from there. ~/docker_image_1 $ docker build -t forthscale/guardians:1.1 . In docker run command flag -v allow to map any local directory to any read/write directory of the image. When running docker inspect [CONTAINER] it will list volumes with read/write permissions that you can rewrite.